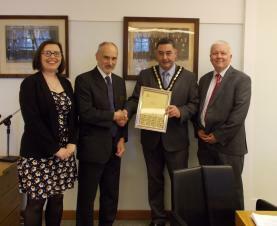 Skegness Town Council has achieved the highest recognition in the Town/Parish Council sector, the Local Council Quality Gold Award. The Council set the high bar of achieving the Gold Award as a way of driving improvement and demonstrating to Skegness residents that the Council operates efficiently and to very high standards. "Getting this award recognises the effort and hard work put in over the last 18-24 months by everyone involved with the Council. Without the backing of a great team who always support each other and look for ways to improve and make a difference, we could not have achieved this standard. Every single member of the team has reason to be proud." As per the National Association of Local Councils website, the Quality Gold Award demonstrates that a council is at the forefront of best practice and achieves excellence in governance, community leadership and council development. Quality Gold councils provide leadership for their communities, bring people together, have excellent business planning processes, ensuring value for money as well as constantly seeking new innovations and opportunities to improve. They highlight the very best we, as a sector, can achieve for our communities. Skegness Town Council has decided to apply for the Quality Gold Award. XHTML 1.0 validated. WCAG compliant. Page generated in 0.0845 seconds.